Presenter Claudia Hammond talks to children of parents with mental illness and family psychiatrist Alan Cooklin, who set up the UK charity, the Kidstime Foundation. Ayesha and Keera share their experiences of living with and looking after a mother or father with conditions such as schizophrenia and severe depression. The number of young people who smoke is on the rise in sub-Saharan Africa while rate of take-up of the deadly habit by youth is falling in Europe and North America. Africa’s tobacco trend was a key issue of concern for experts at the recent World Conference on Tobacco or Health in Cape Town. 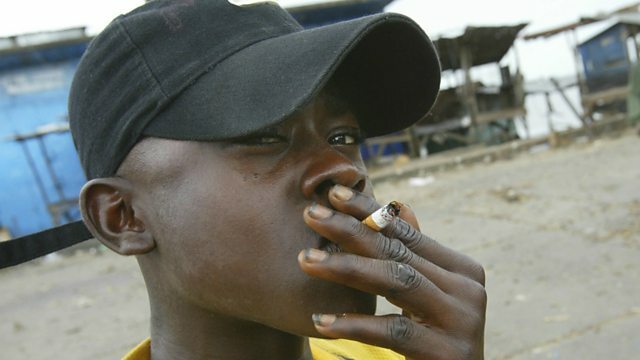 Doctors dread the consequences for Africa’s young smokers as lung disease caused by tobacco will be exacerbated by the region’s high HIV and TB rates. One describes the situation as ‘a perfect storm’. Hannah McNeish reports from Cape Town. Claudia is also in South Africa, in rural Kwazulu Natal. She gets a tour of a medical clinic in a truck by Prof Deenan Pillay of the Africa Health Research Institute. It’s one of several which will be driving out into remote communities for a massive study of 50,000 people on the socio-economic and biological factors which influence fortunes of patients with HIV and/or TB. In this area of South Africa, 30% of population is infected with HIV and 30% of recorded deaths are down to TB. Family doctor Ann Robinson is Claudia’s studio guest talking about a massive new global study of lower back pain and evidence-based strategies to dissuade young people from starting smoking. Ann gives a brief backgrounder on Novichok nerve agents and discusses the suggested link between low sperm counts and ill health in men. BBC News – What are Novichok agents and how do they work?